They work with oil and consistently achieve an efficiency near 94%, reaching up to 20% savings compared to conventional boilers. 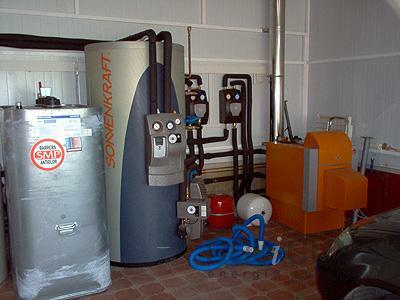 Sun & Climate only offers high efficiency oil boilers; they can save up to 40% of fuel. ¿ Why are Low temperature boilers ? The advanced technology of our low temperature oil boilers allow to regulate very exactly the heat quantity needed for the water flow each second, reaching a very high efficiency. There are two different technologies that respond to the name of low consumption boiler: condensation gas boilers and low temperature oil boilers. The firs ones work only with gas, and the second ones need oil to work. A well sized boiler can work to 100% during a very small amount of time, the coldest days of winter. But boilers don't usually need to work to 100% of performance, they usually range between 30 and 40%. A low temperature boiler is a high technology device that can regulate very exactly the amount of heat to cover the water flow needs. Low temperature boilers are those which technology allos to regulate very exactly the heat amount requiered in each moment. Las calderas de baja temperatura son aquellas cuya tecnología, adaptada perfectamente a cada estado, permite regular el aporte de calor al caudal de agua solicitado y a la temperatura exterior, evita en todo momento arrancar y parar constantemente, y presenta un elevado rendimiento energético. De esta forma se consigue aprovechar al máximo el calor generado, se reducen las pérdidas, el consumo de combustible y la emisión de gases. Pueden calentar, por ejemplo, agua a 40ºC para uso sanitario o calefacción para suelo radiante en modo estacionario. Poseen un rendimiento estacionario cercano al 95%, con lo que se consigue un ahorro energético y económico que oscila entre el 20 y el 30% en comparación con una caldera convencional. Interchange surfaces in steel to optimize thermal transmision an ease cleaning. Removable combustion chamber. Big combustion chamber for a clean combustion and decreasement of unburned staff. Evolution EV F, with steel body. Both boilers are watertight and can work with oil, offering high efficiency, reliability, saving and comfort. Disponemos de un Servicio Tecnico especializado en todo tipo de calderas, dispositivos de alta eficiencia como el suelo radiante, o energias renovables como la solar. Solicite un presupuesto. Sun & Climate offers an expert Technical Support Team, skilled in every type of boiler, and in other high efficiency devices, such as radiant floor heating, or renewable energies as solar power. Arrange an estimate with us.